There is no Gmail app on the Kindle Fire, just the default Android Email app. It is very familiar and offers pretty much the same functionality and UI as the regular Android email client. Multiple email accounts are also supported. If you add multiple accounts, then the Combined Inbox feature will come in handy. Tap&Hold on an email gives access to the basics - delete, forward, reply, spam, etc. The bottom bar offers advanced settings, refresh, search and the new email key. Both players launch when you tap on the dedicated Music or Video shortcut on the homescreen. The music player is not too bad at managing your audio files but there's definitely room for improvement. The interface uses four tabs, which offer the four main ways to search your music collection - by artist, album, song or the playlists you've created. At the bottom of that list you can find quick music controls as well. Repeat and Shuffle are available too. The Now Playing screen is straight-forward - the album art occupies the better part of the screen, the rest are music controls, volume bar and the song scrubber. Equalizers are available from the advanced settings. There are shortcuts to the Amazon Store and Cloud so you could shop music with just a few taps and access your purchases right away. Your purchased videos are stored into the Video section, while the ones you've uploaded are found in the Gallery app. The app is the same as the Android's standard one, minus a few tricks. It shows your pictures and videos in stacks, there is slideshow option and multi-touch zooming. That's it. The Gallery's video capabilities are limited to MP4 playback, but it is capable of handling every MP4 video up to 1080p (incl.). 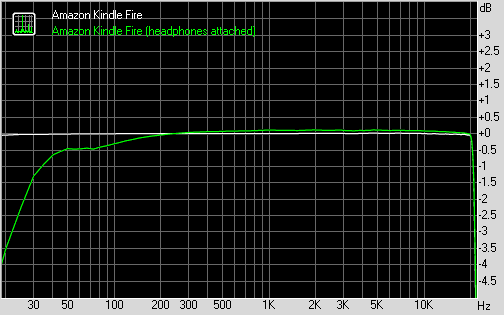 We also tested the loudspeaker performance of Kindle Fire. As it turned out its stereo speakers are really quiet even when you've set the volume to the maximum level. Quite expectedly the Kindle Fire scored Below Average in this test. 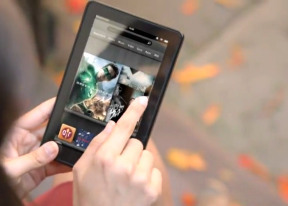 We were really imressed by the Amazon Kindle Fire performance in our audio quality test. The slate was basically perfect when connected to an active external amplifier and even applying the resistance of a pair of headphones to its lineout didn't cause much degradation. As you can see from the scores below, the Amazon Kindle Fire gets excellent scores on every part of the no-headphones test. Its volume levels are only average, but its audio output is so clean that we doubt anyone will mind. What's even more impressive is that very little goes wrong with headphones too. Some hardly detectable intermodulation distortion comes up and the extreme bass frequencies suffer a tiny bit, but you'll barely be able to detect that with a naked ear. And just look at the stereo crosstalk - it's barely affected. The volume levels are also pretty high here, rounding up a pretty great overall performance.